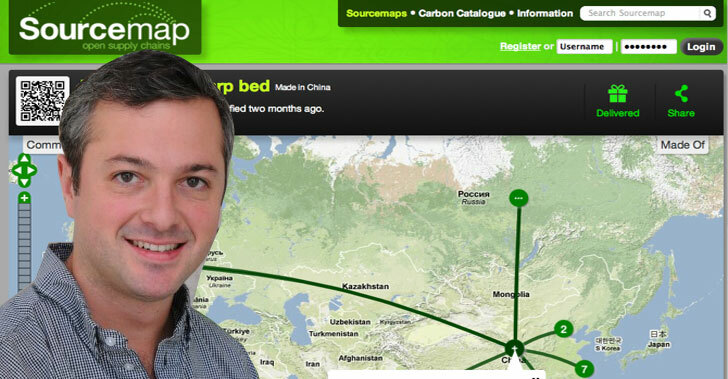 If you haven’t discovered it yet, Sourcemap.org is an amazing free open-source software project that allows people all over the globe to track the origin and source of all of the materials that go into our everyday products, and share this information publicly. The founder of Sourcemap.org, Leo Bonanni, created this project to encourage more public transparency and accountability around product manufacturing and materials and to share this information with the world. As Bonanni says, it is about, “publishing the story behind products: what they are made out of, where they come from and what the environmental and social impacts of that might be.” Watch our exclusive video interview with Bonanni — from the 2010 Greener Gadgets conference — above. At the 2010 Greener Gadgets conference Bonanni told the audience that the founders of Sourcemap.org didn’t, “want there to be any excuse for people to not know where things come from.” On their open source website you can track the components of your laptop computer, your iPod, your new Ikea bed or your brand new kitchen appliance back to the mines where they were exhumed from the earth. You can even learn about those mines, the people that work there, and how they function. The website allows anyone to go in and build a Sourcemap of any product on earth, create a carbon footprint for each product, and then share that information with the masses. The technology allows anyone to go in and learn about where things come from, how they are built and how far they are shipped. If you are looking to make informed decisions about your purchases, this is a great place to start. Bonanni describes our current use of rare materials as a widespread problem — most electronics contain rare earth minerals which are in limited supply, yet many people buy them and discard them as if their components were infinite. what happened to this project? All the links here don't work. The idea that we can track the source of the materials readily available in our consumer products is interesting. But the idea of identifying the source as to put an end to the use of materials in specific countries, not so much. To deny access is to deny trade, and as we all know Trade makes us richer. We don't need a map to know roughly 30 percent of the worlds rare earth metals come from China used to make the motors and wind turbines and solar panels. Elements like Lithium, Neodymium, Osmium, Praseodymium. Mining, refining, and recycling of rare earths have serious environmental consequences if not properly managed. A particular hazard is mildly radioactive slurry tailings resulting from the common occurrence of thorium and uranium in rare earth element ores. But no one cares, after all we need those "green" electric cars and electric generators. Sourcemap is a fantastic tool. Leo did a presentation for our commercial design and construction community a few weeks ago (http://www.slideshare.net/aarongrt). What's valuable for the building industry is that information product supplies chains are so difficult to come by and that, as a result of green programs such as LEED, Pharos Project, 2030 Challenge, ISO 14000, and others, there is an increase in information about these products that can then be stored and shared publicly on Sourcemap. This tool also has potential applicability for design and construction firms in the Sustainable Performance Certification program: www.greenroundtable.org/certification. 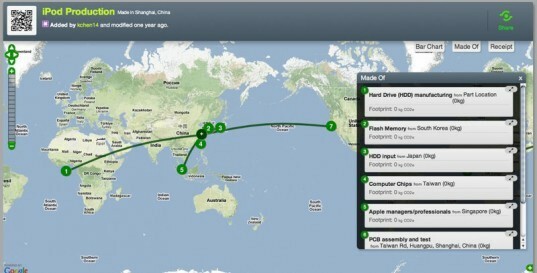 If you haven't discovered it yet, Sourcemap.org is an amazing free open-source software project that allows people all over the globe to track the origin and source of all of the materials that go into our everyday products, and share this information publicly. The founder of Sourcemap.org, Leo Bonanni, created this project to encourage more public transparency and accountability around product manufacturing and materials and to share this information with the world. As Bonanni says, it is about, “publishing the story behind products: what they are made out of, where they come from and what the environmental and social impacts of that might be.” Watch our exclusive video interview with Bonanni — from the 2010 Greener Gadgets conference — above.